A projectile is initially accelerated (interior ballistics), passes through some intermediate space which may be filled with a fluid such as air (exterior ballistics), and then interacts with its target (terminal ballistics). This document will be concerned primarily with the target interaction and secondarily with the interactions with the fluid (if any) between the projectile accelerator and the target. Very often, the quantity of primary interest is the penetration, or distance the projectile can move through the target before it will be brought to a stop. Penetration is nearly universally a function of sectional density, or mass divided by the frontal area, of the projectile. In most physically relevant situations, this is a strictly linear function (with one important exception, which will be discussed later). The penetration is also a function of the projectile speed. At relatively low speeds, penetration is nearly quadratic in speed, but as speed increases the penetration becomes only weakly speed dependent until, at the very highest speeds the penetration is essentially constant. The penetration is not always a monotonically increasing function of speed, in some circumstances there is a speed that gives maximum penetration and lower or higher speeds will result in decreased penetration. We will discuss the penetration in various physical regimes. The simplest cases to analyze are where the projectile retains structural integrity as it penetrates its target. At low speeds, the primary impediment to penetration is material strength. It takes a certain amount of pressure or tension (generalized as stress in the technical litterature) to deform a material by a given amount. For penetration, we are primarily concerned with the pressure exerted by the projectile on the target. If the pressure is below the elastic strength of the target, the target will not be permanently affected and will just bounce back into shape when the pressure is removed. Beyond the elastic limit, the target will suffer permanent deformations. If the pressure exceeds the yield strength, the target material begins to weaken as it deforms leading to a runaway deformation ultimately resulting in rupture. For thick targets, however, the projectile also needs to compress the material in front of it and to the sides to allow enough room for the projectile to pass. The pressure at which this compressive penetration can occur is called the cavity strength, which is usually about three times the yield strength. dE = Yc A dx. xp = E / (Yc A). xp = m v² . As mentioned, in this regime penetration is linear in sectional density m/A, and quadratic in speed. This is the realm of slings and arrows. Bullets are moving fast enough that other forces come into play. As a projectile pushes its way through the target, it must move the target material out of its way. This imparts kinetic energy to the target material that must come from the projectile, and the faster the projectile is going, the faster the target material must end up travelling in order to get out of the way in time and the move energy is used. At high enough speeds, these dynamic forces needed to push the target material out of the projectile path far exceed the material strength of the target and the physics of the problem becomes one of hydrodynamics - at these speeds, the target can be considered a fluid without material strength. where cd is the coefficient of drag and ρt is the density of the material through which the projectile is moving. In a true fluid, where the fluid flows back around the end of the projectile, cd can be significantly lower than 1 to perhaps 0.1 for long, thin darts. In targets that are rigid however, it is found that cd &approx; 1.
dE = -½cd A v² ρt dx. dE = -cd A (E/m) ρt dx. E(x) = E0 exp(-cd (A/m) ρt x). x &approx; 2 xc ln(v0/vthr). Again, we find linear behavior in the sectional density, but the penetration increases only slowly with increasing velocity. This hydrodynamic realm is where we find projectiles passing through any true fluid, such as bullets or arrows going through air en route to their targets. High speed bullets may initially exhibit nearly hydrodynamic behavior when passing through tissue. dE = -[cd A (E/m) ρt + Yc A] dx. E(x) = E0 exp(-cd (A/m) ρt x) - (Yc m)/(cd ρt) [1 - exp(-cd (A/m) ρt x)]. cd ρt A ⌊ (Yc m)/(cd ρt) ⌋. The previous results have all assumed that the projectile is causing ductile deformation of the target, which requires compressing the target material to make room for the material in the path of the projectile to be pushed out of its way. As previously mentioned, the pressure to do so is about three times the yield strength. If the target is thin enough, however, it only needs to be pushed forward rather than compressed and pushed to the sides. This will require at most the yield strength, so it can occur at significantly lower pressures. 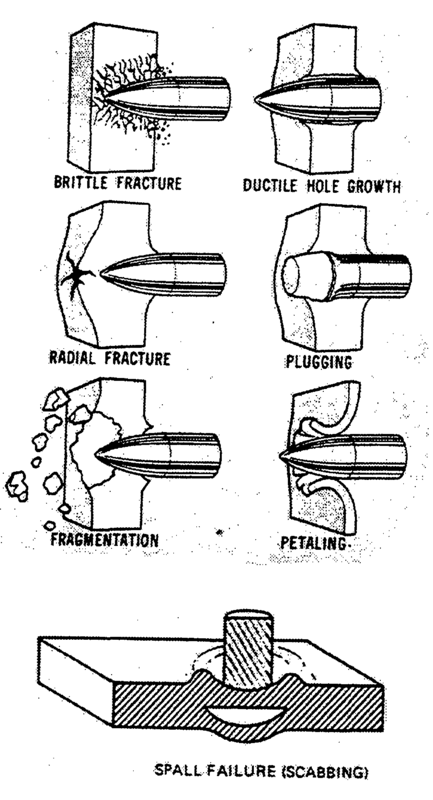 In addition, if the target material begins to rupture, stress can be concentrated along the cracks that are formed and released by simply elongating the cracks rather than deforming the bulk material, and then bending the resulting petals out of the projectile's path or pushing aside the plug or fragments of material that break off. Petalling is the primary mode of penetration for thin armor. Penetration occurs in three steps. First, the initial impact of the projectile starts the portion of the plate directly in front of it moving at the same speed as the projectile. Second the impact stretches the material in front of the projectile as it makes a dent until the top of the dent ruptures. Stress in the strecthed dent is rapidly released by the formation of cracks radiating from the top of the dent, resulting in triangular petals. The third stage involves the projectile bending the petals back until they allow passage of the projectile. Es = ½ A x Yy. where Yy is the yield strength of the armor material. Fd = ½cd A v² ρt x/r. β = cd (A/m') ρt x/r. E(z) = E0' exp(-β z) - [exp(-β z) - 1 + β z] k/β². Eb = π² r x² Yy ⁄ 4. Fb = π² x² Yy ⁄ 4. = E0' exp(-β z) - [exp(-β zs) - 1 + β zs] exp(-β (z-zs)) π x Yy/(2 β² εy) - Yy (π²x²/(4β)) [1 - exp(-β (z-zs))]. The limit of penetration comes when E(zs + r) = 0. Since x appears in the exponents (through β) and in the prefactors, there is no analytic solution. However, solving for the root of this equation is simple using methods such as bisection. The stretching term will be a larger contribution than the bending term for targets whose thickness is less than the projectile radius, while the quadratic term in the bending contribution becomes more important as the target becomes thicker than the target. However, the quadratic increase in energy with thickness only holds as long as the energy to cause petalling is less than the energy for ductile deformation. In this sense the quadratic term enables the smooth cross-over in energy from thin to thick plates, with the former being about 6 times easier to penetrate compared to what would be expected from ductile deformation. The strong thin target limit is the regime in which most armor penetration occurs, whether the projectile is an arrow, a sling stone, or a pistol bullet. High speed rifle bullets may occupy a regime where ductile deformation is more important, particularly for rifle bullets made of hard materials designed to pierce armor with minimal deformation. The discarding sabot long rod penetrators fired by tanks blow right past the thin strong target regime, both because the impact is so high speed that it causes significant deformation of the projectile and because the high sectional density allows penetration to a significant fraction of the projectile's very long length compared to its radius. At high enough speeds, the dynamic pressure of the projectile ramming its way through the target will exceed the yield strength of the projectile and it will start to deform. This intermediate speed regime is a reasonable description of bullets passing through tissue or ballistics gelatin. 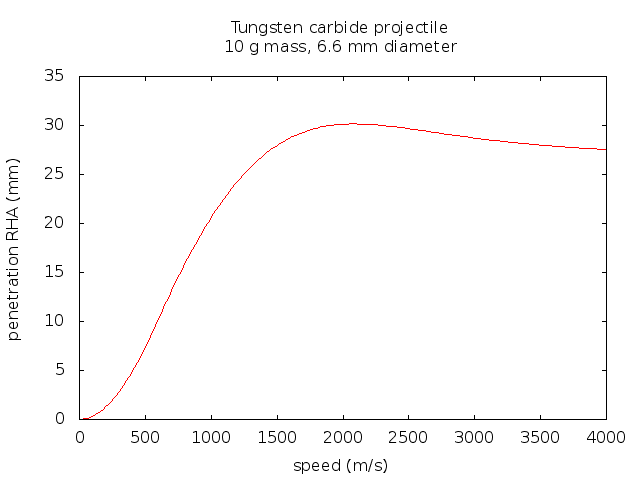 Tate model of penetration of a tungsten carbide projectile into rolled homogeneous armor. Note the initial quadratic increase in penetration with speed which rises to a maximum penetration at about 2000 m/s before falling off to the asymptotic high speed limit. ½ ρt u² = ½ ρp (v-u)².
u = √ ( ρp ). xm = L × √ ( ρp ). In this doubly hydrodynamic limit, the penetration is independent of the projectile speed - it doesn't matter how fast the projectile is going, it penetrates just as far! There are a few caveats to this statement - the debris is still moving with a speed of u with respect to the target, so it can still penetrate some additional distance. This is generally a small but sometimes noticable effect compared to the penetration of the original projectile. Also, the impact will forcefully throw the material of the target forward and to the sides, creating a blast wave and gouging out a crater. In some cases, the size of the crater may be much larger than the distance the projectile penetrated. Hypervelocity impacts of meteors and orbital debris fall into this regime, as do the shaped-charge Munroe-effect jets of certain armor-piercing rounds. Both the target and the projectile are fluids. In this case, the low speed limit is the same as the high speed limit. The pressure is enough to deform the target but not the projectile. This case has already been considered, above. The pressure is enough to deform the projectile but not the target. In this case the target holds steady and the projectile splashes against it. This is the realm of water balloons, and is also seen when jacketed lead pistol bullets encounter thick steel plates. Penetration is zero. At intermediate speeds, the material strength of either the projectile, the target, or both must be considered as well as the dynamic pressure. To this end, we add a material strength to both sides of our hydrodynamic pressure equation, denoted Rt for the target and Yp for the projectile. ½ ρt u² + Rt = ½ ρp (v-u)² + Yp. -ρp L dv = Yp. A. Tate, "A Theory for the Deceleration of Long Rods After Impact", J. Mech. Phys. Solids, 1967, Vol. 15, pp. 387 to 399. A. Tate, "Further Results in the Theory of Long Rod Penetration", J. Mech. Phys. Solids, 1969, Vol. 17, pp. 141 to 150. It is in this regime that we find the fin-stabilized discarding sabot kinetic energy penetrators fired by smoothbore tank cannons, as well as rifle bullets against various hard targets. Hollow-point pistol bullets and soft-point rifle hunting bullets initially deform after impact, but after mushrooming out to expand to about twice their original diameter thay seem to stop deforming and thereafter penetrate as rigid, non-deforming bodies. What about when a squishy lead bullet smacks into a strong but thin steel plate? The intermediate speed equations work well for ductile penetration, but have serious difficulties for other failure modes. For example, they preduct zero penetration of lead bullets into steel at speeds of less than 800 m/s or so. This is accurate - if the steel is sufficiently thick. Against thick steel, lead will just splash and not even dent the steel. However, as the steel gets thinner, it takes less and less force to stretch it until at some point even lead can punch through. Anyone who has ever gone plinking against used cans knows this. End = ½ A x Yy + π² r x² Yy ⁄ 4. ½ ρt u² x/r + Rav = ½ ρp (v-u)² + Yp. This is then integrated in the same way as penetration at intermediate speeds against deep targets. The integration gives a penetration, and we keep varying x until the penetration equals zp. The larger of the ductile penetration and the slab thickness penetrated by stretching to failure is used for the final penetration. The results are remarkably good, although the steel cores of many bullets may be made of a harder steel than what is assumed here, or perhaps the steel penetrator has a carbide cap. How does all this apply to GURPS? Penetration will not be linear in sectional density, because the frontal area has too little of an effect. Penetration is linear in projectile speed, or proportional to the square root of the energy. As we have seen, this fails both at low speeds (where penetration is quadratic in speed) and at high speeds (where speed has relatively little effect on penetration). The regime where this scaling could best be justified is in the transition between strong thin targets, with a target thickness significantly less than the projectile width, and strong thick targets where the thickness is significantly more than the projectile width - a relatively narrow region of parameter space. The values begin to diverge between this model and printed damage values for cannons and other heavy weapons, as expected - this model takes into account proper physical scaling while the square root of the kinetic energy does not. This will start to come into play for characters and objects much different from human scale - rodents and vehicles and buildings and ships (both nautical and spacecraft) where the guideline of DR as linear in thickness and HP as the cube root of mass (and thus also linear in thickness) imply that penetration should be linear in damage dice. This discrepency has been noted before, as in Pyramid Issue 3/34, and various forum discussions. Of course, it is impossible to choose one value of penetration that scales correctly with projectile speed against all targets without introducing more parameters (and more on-the-fly math) into the stats of game-relevant targets than just DR and HP. However, the above model allows proper scaling with projectile and target size, and should give results that are less likely to break suspension of disbelief. What does the GURPS damage formula above actualy represent? Clearly it is penetration by a rigid projectile, but penetration of what material? It is not Rolled Homogeneous Armor (RHA, the real-life and GURPS standard for penetration, with DR 70 = 2.54 cm of RHA), since lead bullets go sploosh when they hit steel. Lead is much softer than steel, and a thin jacket of copper is not going to chage that. A splooshing lead bullet can still penetrate RHA if it delivers enough dynamic pressure, but not as a rigid body. Since just about any armor material will be harder than lead, the same argument applies to rock, brick, titanium, boron nitride bullet resistant plates, and so on. So what about living bodies? We know that a HP 10 character provides DR of 10, and humans are roughly 25 cm thick. Lead pistol bullets or shotgun slugs will not usually deform when punching through meat and gristle and viscera without special engineering (for example, hollow points). Rifle bullets go fast enough that simply exposing lead at the tip will cause them to deform and mushroom out, but a simple skin of copper over the tip will prevent this. Does human tissue have a vthr of 100 m/s? Unfortunately for our inquiry, tissue has widely varying material properties, with skin responding quite differently from muscle which is different from liver tissue which is different from tendon which is different from bone. Bullets are usually tested and callibrated on a gelatin tissue simulant, which is supposed to mimic the resistance of human tissue. How well it does this is open to debate, but at least it provides consistency and uniformity. A vthr of about 50 m/s does a reasonable job of describing penetration of various pistol and rifle bullets into ballistics gelatin. If we throw in the interaction of the bullet with bones, skin (which is much tougher and stronger than muscle tissue), cartilage, and sinew a vthr of 100 m/s does not seem too unreasonable. All the cartridges on the table above have a bit less penetration than you would expect from ballistics gelatin tests, which we can again attribute to tougher and stronger tissues the bullet may have to punch through on its passage through its unfortunate victim. Then what about armor penetration? A lead bullet will not cause bulk ductile deformation of steel until it gets to a speed of more than 870 m/s or so. If the steel is thick enough, it will not even dent at speeds lower than this. The bullet just splashes off. We see that GURPS damage consistently over-estimates the penetration from lead bullets. The copper jacket will help a little, as will the fact that most bullets are made of alloys of lead with tin or antimony than harden the metal. A Yp = 500 MPa and the usual density of lead gives good agreement with GURPS penetration values. GURPS damage gives very good results for slow moving projectiles like arrows, and an armor divisor of (2) is a good estimate for the penetration of hard, dense armor piercing bullets at speeds above 200 m/s or so. We have seen that our model reproduces GURPS damage reasonably well for even low energy projectiles, such as arrows. What about the other extreme? To some extent this is unimportant for most engagements with man-portable weapons, because even Ultra-Tech super-duper gauss guns have to punch through atmosphere and at super-high velocities we are firmly in the doubly hydrodynamic limit. Air has a density of 0.0012 g⁄cm³, so even a projectile made out of the densest matter held together by chemical bonds (about 20 g⁄cm³) will only travel about 130 times its own length. For man-portable weapons, this will mean ranges of only a few meters. Of course, not all combat occurs between people mucking about in an atmospheric soup. GURPS may also deal with spacecraft duking it out with kinetic kill interceptors. These hypervelocity projectiles will penetrate about 4.5 times their length into meat and 1.6 times their length into RHA. Of more concern, however, is the way all that kinetic energy will turn into the energy of a blast wave as the impact violently pushes aside the target with the projectile splashing out into the impact debris, all expanding at supersonic speeds. As mentioned, the kinetic energy is E = ½ m v². One kg of TNT has an energy of 4.2 MJ. At high enough speeds, the armor penetration of the blast will exceed that of the projectile. Sadly for us, the GURPS rules for explosive damage also scale badly, such that large explosions do too much damage and small explosions too little. Since we are tinkering with the rules anyway, here's how we can fix it: First, we assume the fine folks at Steve Jackson Games got the damage about right for one pound of TNT. Then we use the fact that blast damage scales with the cube of the distance (not the square of the distance, as follows from the GURPS rules). Contact damage would also be expected to scale as the cube of the explosive yield. Combining all this gives a damage in dice of 6×(8.8×M×REF)1⁄3 for an explsoive of mass M. For a kinetic energy E in joules, it then follows that the explosive damage is 6×(2.1×E⁄1,000,000)1⁄3. Should this be a Linked effect to the impact, or a Follow-Up? Since a projectile that is not entirely fluid will slow down as it penetrates from the forces of impact, the dynamic pressures will be higher near the surface than after it has reached near its maximum penetration (if only by a little bit), so the distance drilled near the surface contribute more to the blast than deeper in. This argues for a Link rather than a Follow-Up.